Happy first weekend of March. I can’t believe we have already been through two months! This weekend was full of some outstanding meals. The first one was Saturday night’s dinner, Sweet Potato Chili then Sunday started off with a hearty skillet bake breakfast. 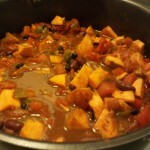 I had been searching through one of my favorite websites, 5 Dollar Dinners, to get ideas on what to make and I had come across sweet potato chili. I thought that sounded outstanding. It seemed like more of a fall choice, but I thought it would be great to enjoy on a cold March night. 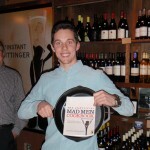 The recipe comes from Perry’s Plate. In a 4 to 6 quart stockpot, sautée the chopped vegetables in one to two tablespoons of olive oil on medium-high heat, stirring occasionally. Once the onions start turning translucent, reduce heat to medium-low. Add all of the spices and canned ingredients, and stir. Cover and let it simmer, stirring occasionally, for about 2 hours. Ladle into bowls and add garnishes. I really didn’t know what to expect, but I was blown away. The spices and seasonings take it to a whole different level. There are some unique seasonings, such as cocoa powder, and cinnamon. 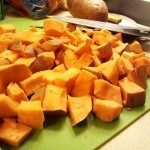 They helped add some great flavors and enhance the sweet potatoes. 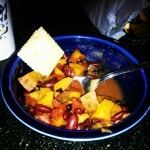 It was a bit on the spicy side with the 1 teaspoon of cayenne pepper, both Dena and I were sniffling. The leftovers keep getting better and better as the veggies, and sweet potatoes soak up all of the spices and flavors. Crack the eggs into each well. Then put the skillet right into the oven. 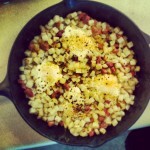 This was a very easy breakfast to make, and very hearty. 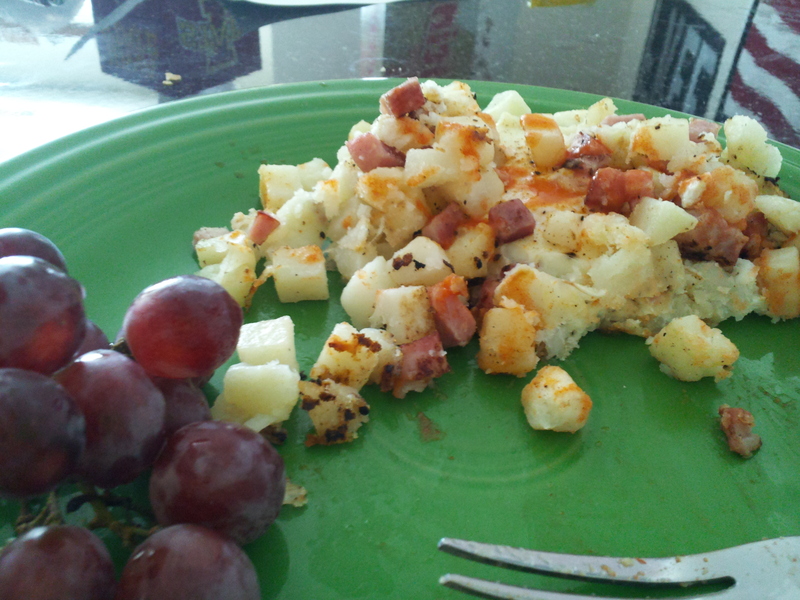 Ham, potatoes, eggs, and coffee. You can’t start a day better than that, okay maybe with some bacon – I’ll add that next time, plus some peppers. I was also excited to make this because I finally got to use my iron skillet that I got for my birthday!